Two remarkable stone churches illustrate pre-revolutionary style. In 1908, Prokudin-Gorsky arranged screen showings of his color images to various groups in St. Petersburg, including members of the imperial court and the State Duma (parliament). After a meeting with Emperor Nicholas II in May 1909, Prokudin-Gorsky’s project received official support from the Ministry of Transportation, which facilitated his photography along Russia’s rail and waterways. 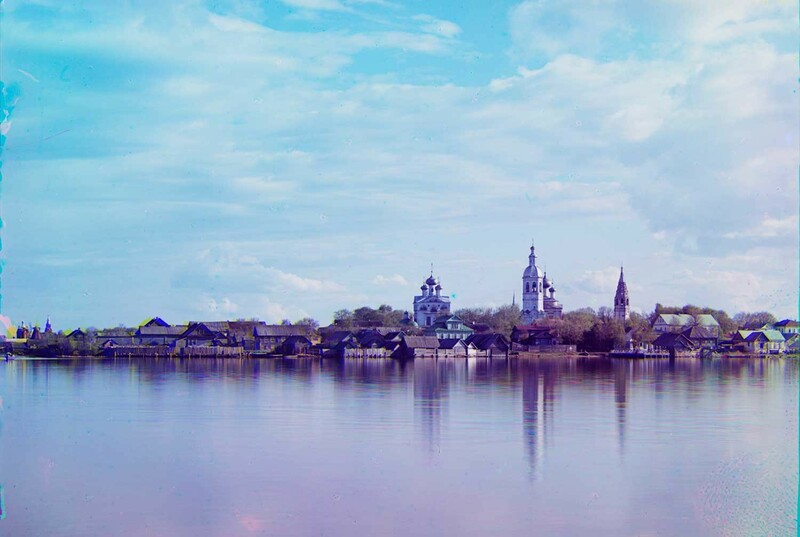 In May 1910, Prokudin-Gorsky continued his work in the Volga River basin with a trip to Ostashkov, located on a spit of land extending into Lake Seliger to the south of the monastic community at Nilova Pustyn, located in modern-day Tver Province. The first references to a Russian settlement near the site date to the late 14th century. At that time, the settlement was known as “Klichen,” which to this day is the name of an island now connected by a causeway to the north of town. Klichen seems to have been abandoned after a raid by forces from Veliky Novgorod in 1393. At that time, the settlement served as a border post for the Rzhev principality, which was allied with Novgorod’s rival, Moscow. According to local legend, a survivor of the raid, a man known as Ostashko in the local dialect, founded a new settlement on Ostashkov’s current location, a peninsula to the south of the island. 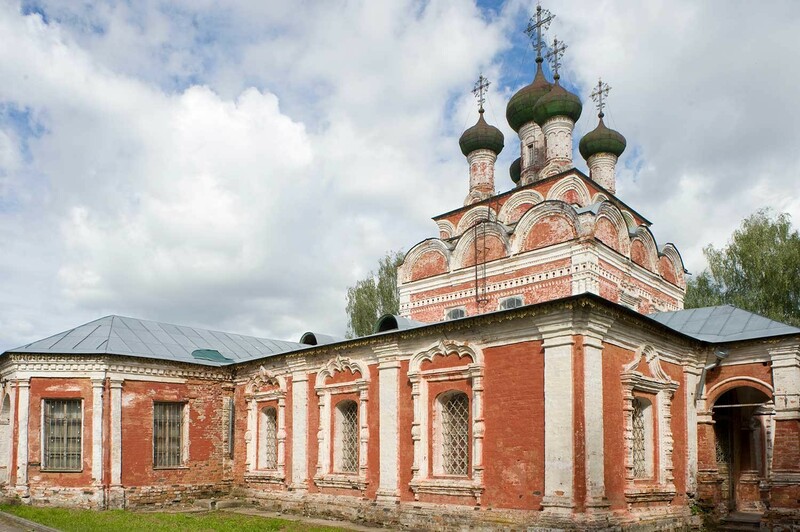 Medieval Ostashkov benefited from ties to the church hierarchy in Moscow and to the powerful St. Joseph Volotsky Monastery near Volokolamsk, which was granted privileges in the town as early as 1500. The two parts of town were designated “Patriarch’s” and “St. Joseph’s”. During the early 17th-century dynastic crisis known as the Time of Troubles, Ostashkov was occupied by rival factions in 1608 and 1609. Log fortifications erected within the settlement in 1587 were sufficiently strong to withstand a renewed Polish attack in 1610, but much of the town beyond the walls was destroyed. Fortunately, Ostashkov soon recovered. Its role as a strategic border post and its location on a network of waterways between Veliky Novgorod to the northwest and the Volga River basin to the southeast led to robust economic growth in the 17th century. In addition, Lake Seliger gave the town rich source of fish. A major fire in September 1676 swept through the center of town, but the economic base remained. 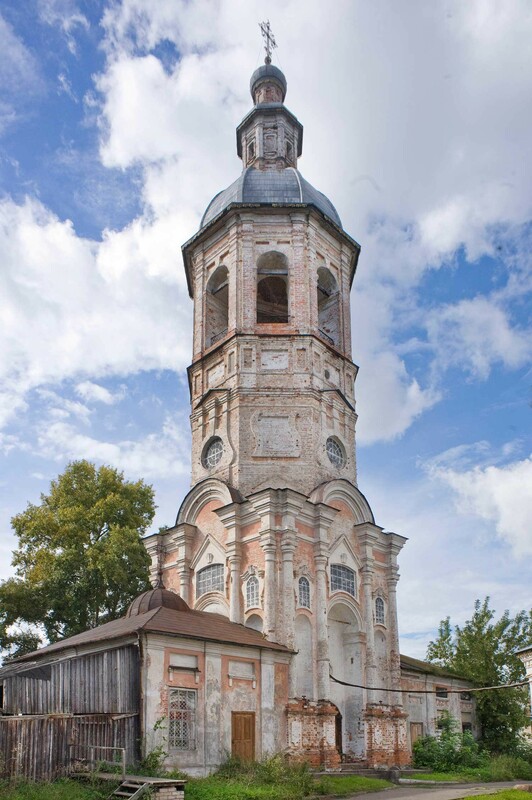 The town’s prosperity and the need to rebuild after the fire were reflected in the unusual construction of not one but two large masonry churches (sobory in Russian) during the late 17th century. The first was dedicated to the Resurrection, and the other to the Trinity. 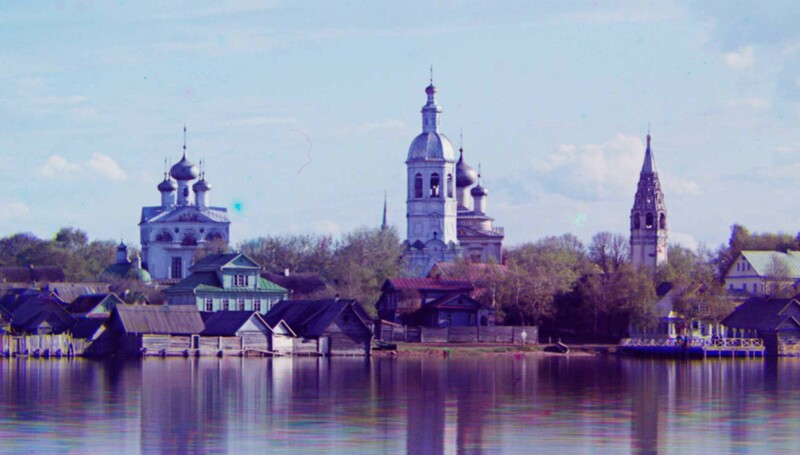 Prokudin-Gorsky’s photograph of Ostashkov from Voroni Island across an expanse of water to the east shows the connection between the lake and the town, with the churches in the center. My photographs, taken in August 2016, give a detailed view of the central church ensemble, including two free-standing bell towers. 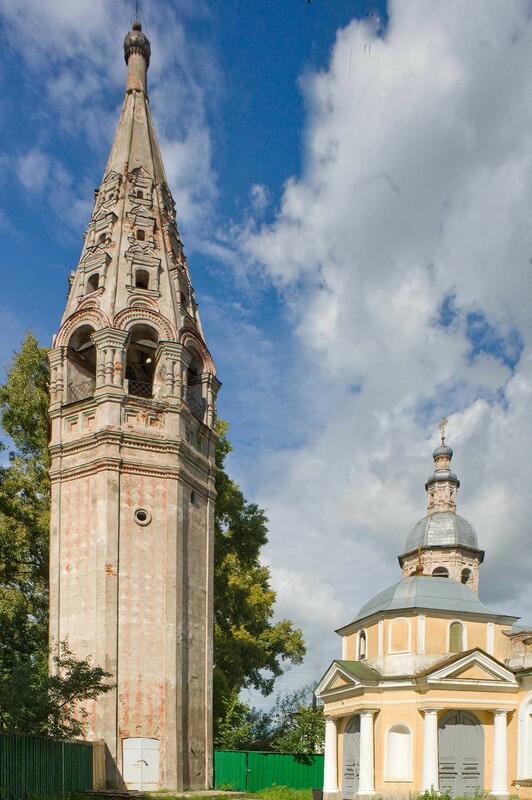 The more colorful of the two monuments was begun in 1685 and consecrated to the Holy Trinity in 1697. Originally the Trinity Cathedral displayed ornamentation typical of the late 17th century, with decorative window surrounds and niches. The five cupolas at the top rested on an array of semicircular decorative gables (zakomary). 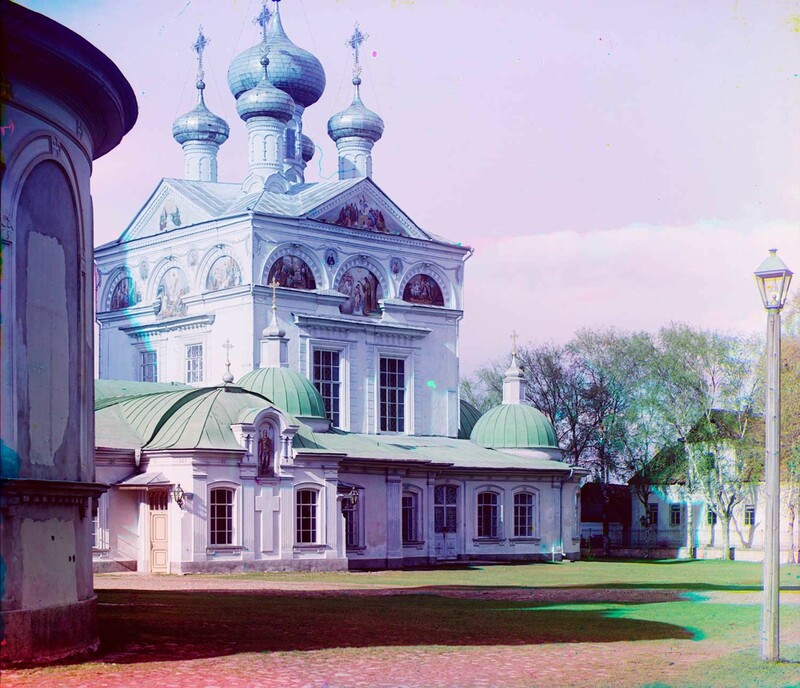 During the 18th and 19th centuries, the Trinity Cathedral was modified more than once, including a rebuilding of the roof with the neoclassical pediments visible in Prokudin-Gorsky’s photograph from the southwest. In the mid-18th century, the cathedral gained a one-story enclosed gallery (partially visible in his photograph) and four secondary altars dedicated to the St. Paraskeva Piatnitsa, the Okovetskii Icon, St. George and St. Nicholas. Work also began in the mid-18th century on a large free-standing bell tower just to the west of the Trinity Cathedral. Its style shows Baroque features typical in 18th-century provincial architecture. In 1854, a small treasury was added to the tower’s south façade, visible in my photograph. The Trinity Cathedral was closed in the Soviet period and eventually given to the local history museum, which occupies the premises to this day. The museum transfer enabled the preservation of much of the Baroque interior decoration. In the 1970s, a restoration supervised by Vladimir Yakubeni returned the exterior of the Trinity Cathedral to what was considered its original form. Of special interest is the roofline, which regained its two rows of festive zakomary gables beneath the five cupolas seen in my photograph. 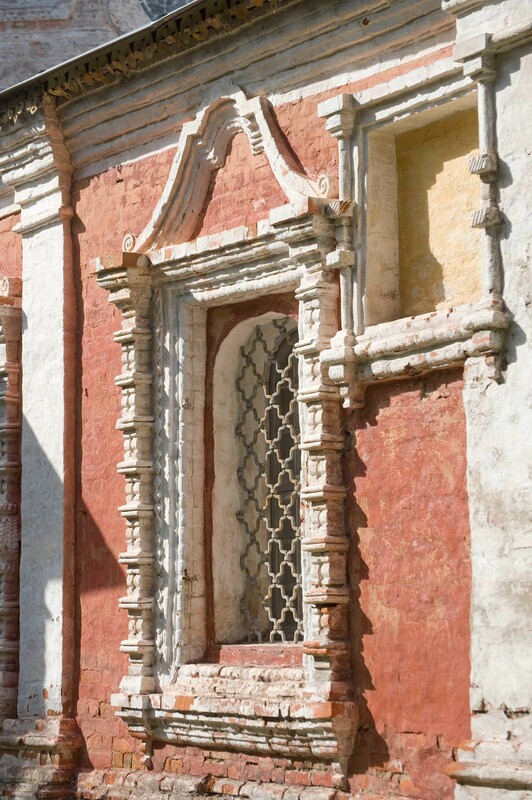 The brick walls were painted bright red with white trim, a style typical in the 17th century. Prokudin-Gorsky’s photograph shows whitewashed walls, which provided a suitable background for the 19th -century paintings within the zakomary gables (now effaced). 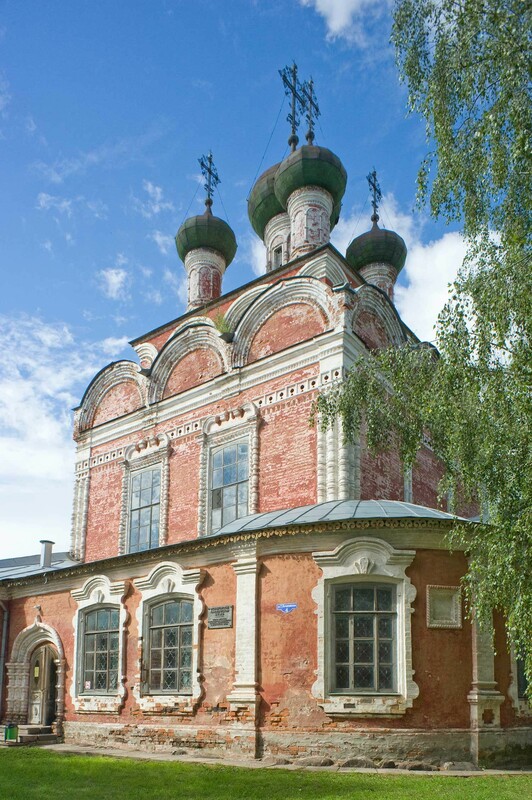 The nearby Resurrection Church, located just to the southwest of the Trinity, was begun slightly earlier, in 1677, with the support of the St. Joseph Volotsky Monastery. Consecrated in 1689, the church had secondary altars dedicated to the Nativity of John the Baptist, St. Joseph Volotsky, the Dormition of the Virgin and the Nativity of Christ. Like its neighbor, the Resurrection Church (which is sometimes referred to as a cathedral) was a relatively simple cuboid structure crowned with zakomary and five cupolas. It too gained a one-story enclosed gallery in the mid-18th century. The interiors of both churches were redone with exuberant Baroque decoration in the latter part of the 18th century. During the Soviet period, the Resurrection Church was less fortunate than the Trinity. 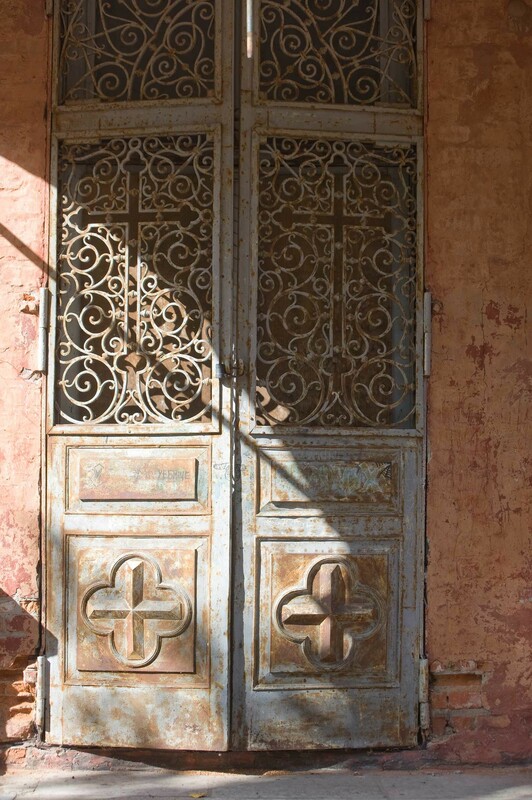 It was converted to a mechanical workshop, yet much of the interior wall ornamentation improbably survived. The main altar has been reconsecrated, although the workshop remained inside as of my visit in 2016. It should be noted that the Resurrection Church and the two bell towers appear in Prokudin-Gorsky’s work only in his distant view from Voroni Island. Nonetheless, this prospective provides information on the relation of the four elements to each other. Ostashkov has lost much of its economic base. Since 1989, the population has decreased by over a third. 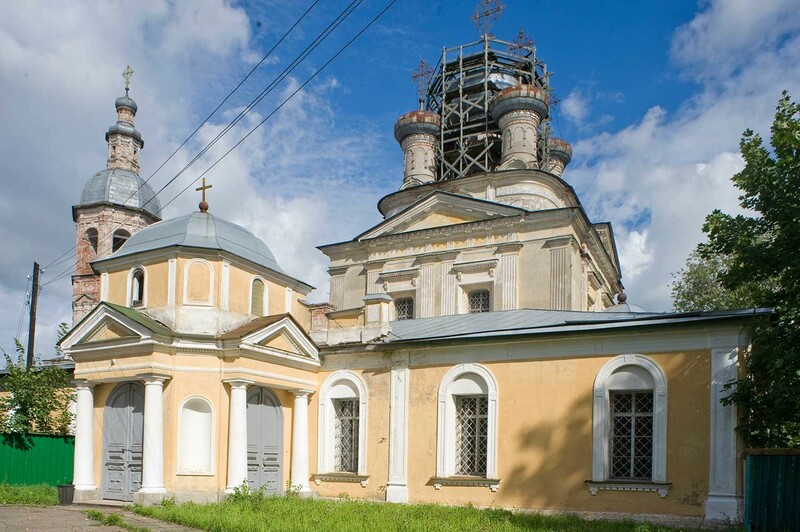 On the positive side, the Orthodox Church has quietly embarked on restoration efforts, and the region’s St. Nilus Monastery has created an increase in tourism. Enormous work is still required to restore the town’s central architectural ensemble.